A saxophone blasted “Careless Whisper” by George Michael at 4:00 am AZ time . . . I’m up, I’m up! My buddy Andrew silenced the saxophone on his phone just before my watch blasted off the wake up alarm. Man, looks like it’s time to move! That night the temp had dropped into the 30s and the other fellas in the tent (Andrew, Larry, and Eric) weren’t exactly ready that kind of chill. As we packed up the camp they complained about getting only four or so hours of sleep. I was alright, but didn’t want to just come out and say I slept like an angel! Soon after packing up camp, an older fella in his 60s pulled up to the Whitehouse Trailhead ready to pick us up for the shuttle to Wirepass trailhead down House Rock Road in southern Utah. Up the sandy wash we go! 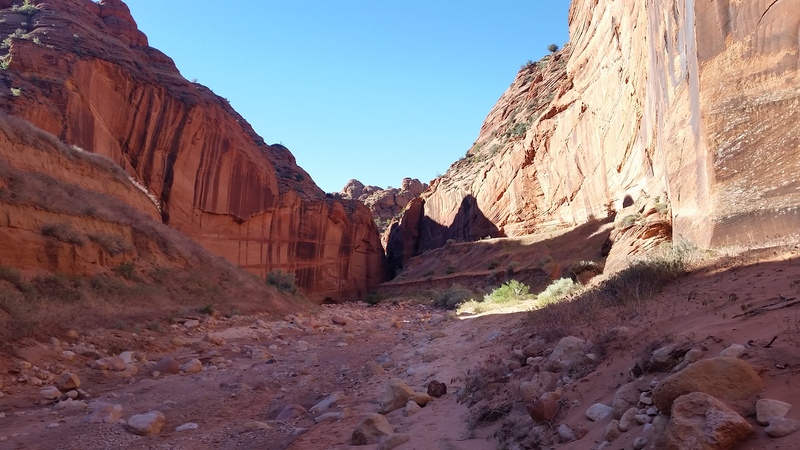 Out target for the day was Buckskin Gulch. 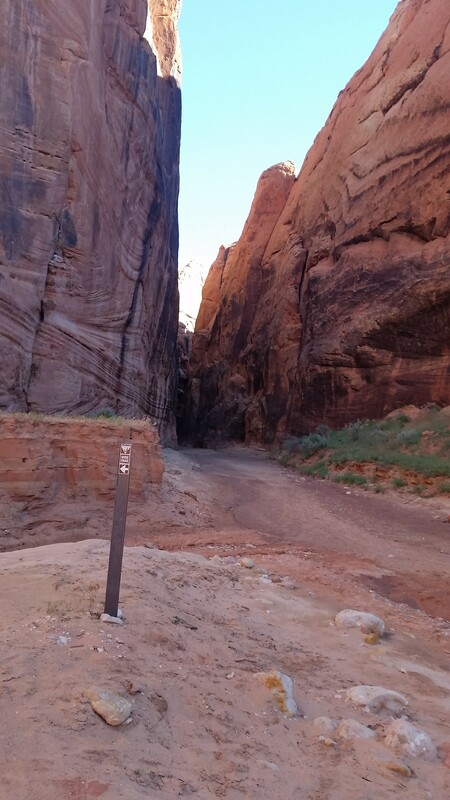 We aimed to complete the 21 mile trek from Wirepass back to Whitehouse trailhead via a 13.7 mile trek down a portion of the longest slot canyon in the world (Buckskin Gulch), finishing with a 7.1 mile trek along the Paria River to our base camp. We were dropped at the trailhead and hit the bathroom for one last stop before the long push. The four of us trekked down the open sandy wash that lead to Wirepass, chatting about future trekking goals and fretting on the onset of the cold water and deep mud that was undoubtedly ahead. Before we knew it the wash narrowed, squeezing into the first section of the close-walled canyon. 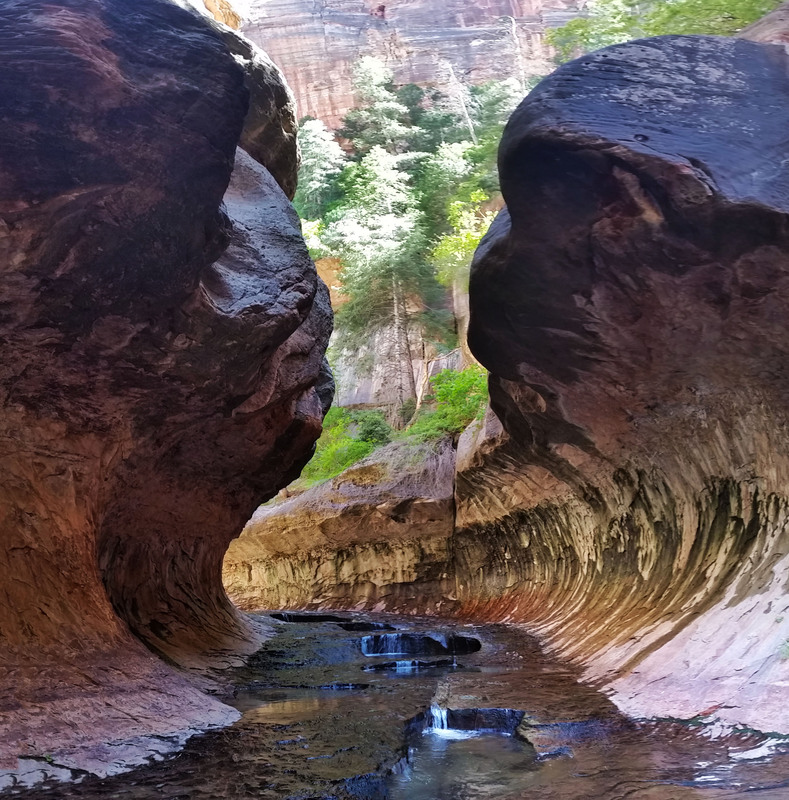 We shimmied our way down into the gap, surrounded by incredibly tall and beautiful sandstone walls shaped by water over thousands of years. Soon we came to our first obstacle, a nice little 7-foot down climb. I dropped down first and gave the other guys a hand one by one until we were all safely on the ground. 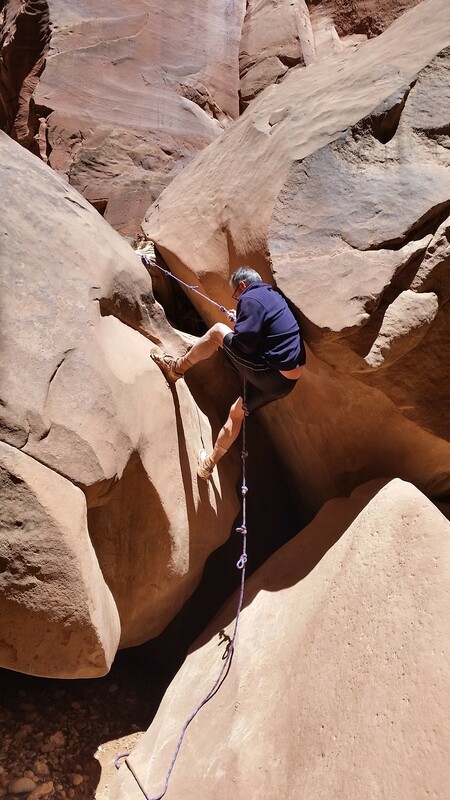 We pressed on until finally opening up into a large confluence between Wirepass and the Buckskin Gulch…it was game time! On the right wall a collection of glyphs were etched into the rock, still bright, standing the test of time. Knowing we didn’t have all day to hang around we pressed on down the gulch. 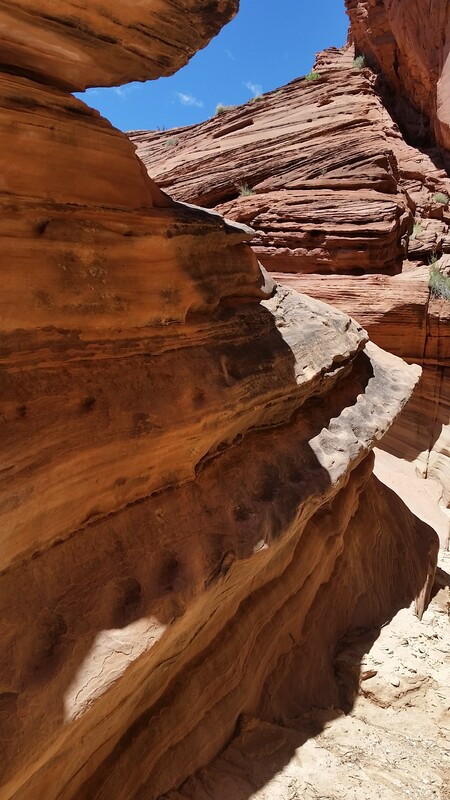 Downstream of Buckskin, further into the belly of the beast! The huge walls rose higher and higher around us. The light touched the tops of the canyon, but only in certain places and at just the right time did it reach the canyon floor. 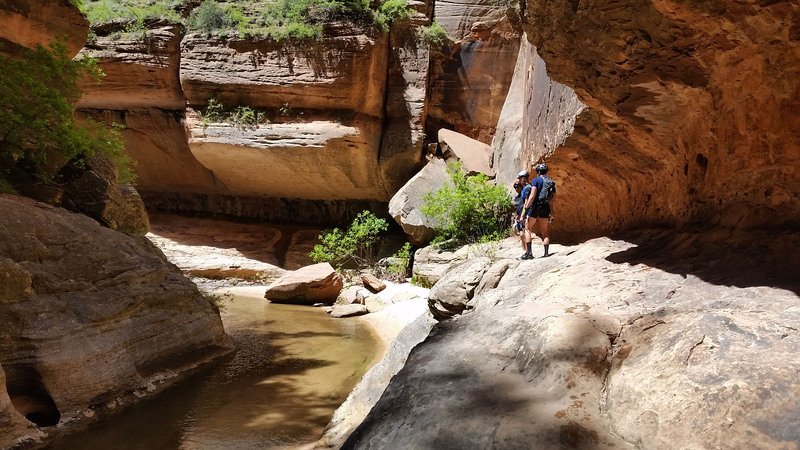 We made our way through the muddy canyon floor, moving quick on anything dry and watching our steps on all the boulders so as not to twist an ankle. Before long we were to the cesspool, a one mile section of deep dark pools that hardly ever see light. I watched Larry, who was leading, as he pushed in the nearest pool and the water went higher and higher around his legs. Whew man it looked cold! Soon after Larry, I plunged in as well. Luckily my neoprene socks aided in warding off the chill of the 40 degree water temps. Whats that in the distance? Who planted stuff down here?! 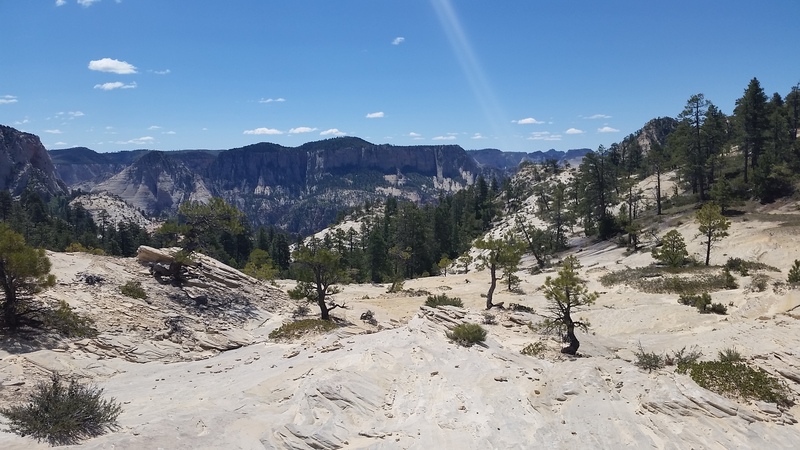 We exited the cesspool and found ourselves at the middle trail, signified by 2 bighorn sheep on the north wall at the base of the escape route. It was steep and sandy, not the kind of place you wanted slip on! I backed away to look high above for a hidden petroglyph panel that was supposed to be 100 ft off the deck. I climbed some cool moki steps on the south side of the gulch and finally found them. How cool! I still have no idea how they got that high to etch the symbols. After checking out the area it was time to press on. 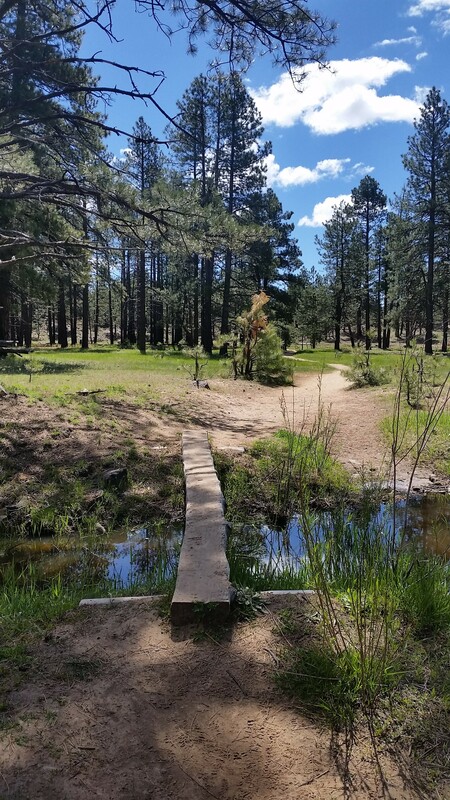 From there the trail was relatively dry, no more pool wading and the mud was at a minimum. We couldn’t have prayed for better conditions! The gulch opened wider in sections, and cottonwoods grew out at the edges on sand bars. After a large opening in the gulch it would constrict back down, twisting and turning the further we trekked. Soon we reached the “Rockfall” which required decent by using a good fixed rope. One at a time we slid down and were soon safely on the bottom. I looked to the right and re-climbed some moki steps, just for fun! Uhhh someone loose their oil drum? From there we knew we weren’t far from the designated camping area at Wolf’s Knoll near the confluence. Sure enough the canyon soon opened wide to two large vegetated dirt mounds on both sides which served as the campsites, high up and safe from flash floods. 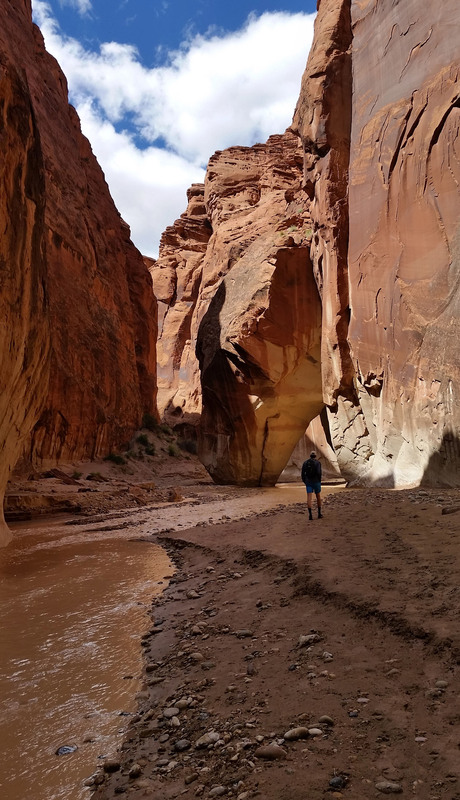 We took in the beautiful sights of the walls stretching up all around us and kept on pressing until finally finding the confluence of the Buckskin Gulch and Paria River. What a beautiful sight! 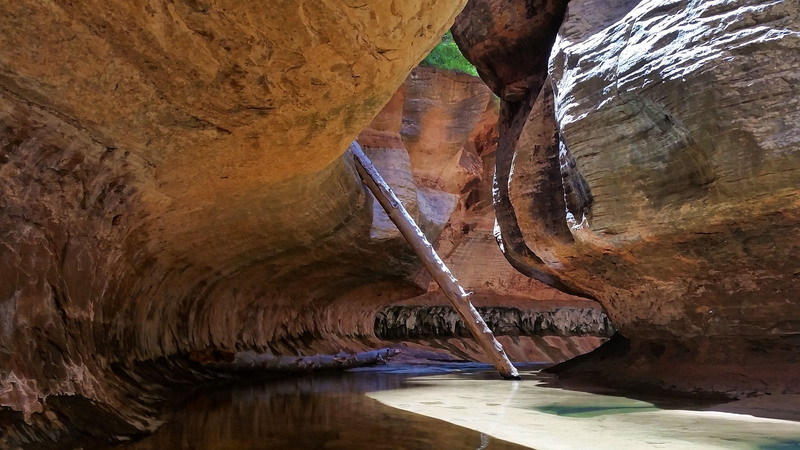 The Paria was flowing gently, brown yet beautiful, through the gulch. Up the Paria Cant make this stuff up! We turned upstream and finished pushing the 7.1 miles up towards the Whitehouse Rock trailhead. 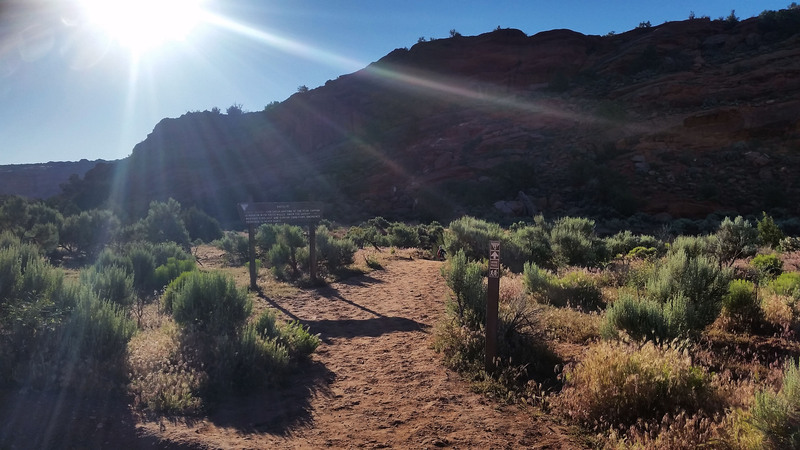 For the first few miles we were still constricted in a gulch, but then finally the walls opened up to wide views of the sandstone hills of the Utah upper desert. 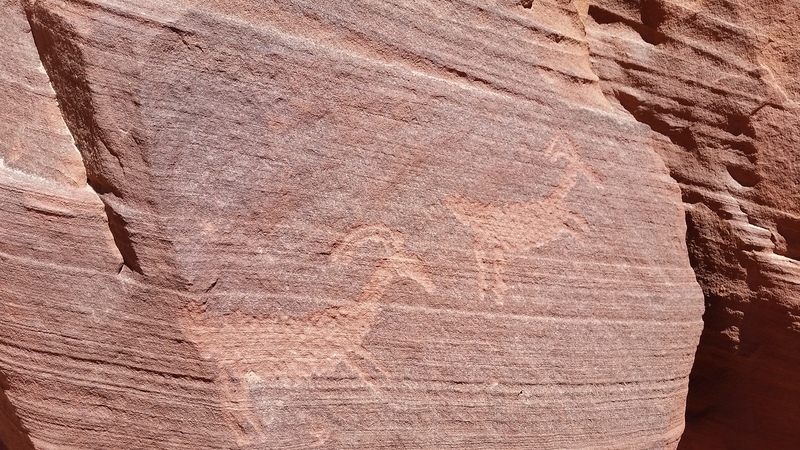 I searched for more petroglyphs along the way as we made our way back and forth across the river. Finally our trek ended where it started, everyone in pretty good spirits and ready for dinner. Another incredible day spent outside! Dont mind the Logs . . . cause that how high the water gets in here! Found some hidden Moki steps! Woken once again by a Saxophone blasting “Careless Whisper” by George Michael Blasts at 4:00 am, I shifted in my bag. Déjà vu from the Buckskin trek the morning before? Nope! Now it was time to pack our things up and head into Zion to grab our permits for the top down canyoneering route called The Subway! Once again Andrew, Larry, Eric, and I woke, packed up, and got ready for the day to come. Piling into the truck with Larry behind the wheel, we headed for Zion. The miles faded pretty quickly despite a rock fall on the east side reverting us to enter instead via Hurricane UT from the west side. 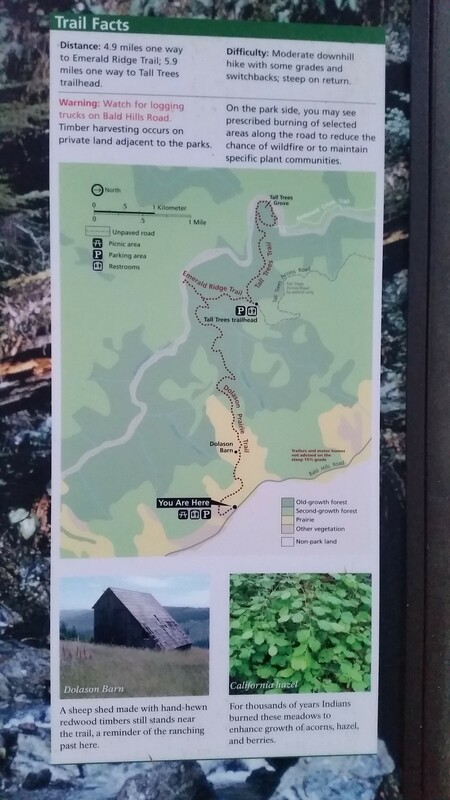 We soon found ourselves at the visitor center, running in and grabbing our permits before driving to the lower left fork trailhead and dropping my bike off to complete the shuttle to the start at Wildcat Canyon trailhead. 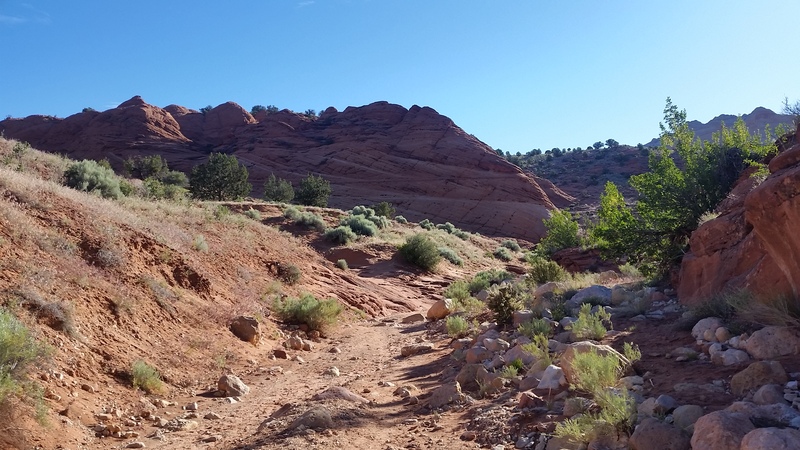 The plan was to start up top, push the 9.5 miles down the technical canyon and pop out at the trailhead where, to add insult to injury, I would ride back up on my bike and grab the truck to finish the loop. We had our work cut out for us so we stepped out of the truck and gathered our packs together. With everything in order at about 11am we set out on the wide open pine-ridden prairie down Wildcat Trail to the southeast. The bluebird skies only had a few clouds and the temps were perfect… couldn’t have picked a better day! Ohhhh I see the dropoff! After a mile down trail, we met the Northgate Peaks Trail and turned right headed towards the lip of the dropoff. The blue sky shone through as we edged closer to the sign that was marked “The Subway Trailhead”. We were all excited and clambered on, down a cairned sandstone rock. We were spit onto a well-cairned and traveled foot trail that headed through the woods and down the slick rock. After many gorgeous open views, we found ourselves at the top of the final steep descent into the bottom of the Russel Gulch. We turned southwest into the Left Fork Creek, and right away we could see the water carved walls that were reminiscent of “The Subway” formation. The canyon was gorgeous, covered in lush green foliage, cool from the shade, and stunning rocks all around. We trekked down the creek until coming upon our first rappel off a Huge VW sized boulder. When we arrived, one group ahead of us was in the middle of rappelling and another was waiting so we took a break for lunch. Looks like a swimmer coming up! Larry, Andrew, and Eric had little rappelling experience but I walked them through the procedure. Soon we were all down safely on the ground past the first 25’ section. We once again turned downstream and after just a hop skip and a jump, we were faced with a large pool . . . welp, no more holding off the wetsuits, it was time to dawn them! We all zipped ourselves up, looking like tadpoles getting ready for our first swim, and walked into the depths of the cool, shallow pool that was only stomach deep. Not but 30 yards later we overlooked a large chalkstone into a small waterfall and our first swimmer… we didn’t put these things on for nothing! I was first to plunge in, and like a dog getting into a pool for the first time I paddled to the other side of the long slotted swimmer. Whew! Larry, then Andrew, and finally Eric all safely dropped in and were following close behind. We all laughed as we exited the pool, happy for the warm sun shining on us. 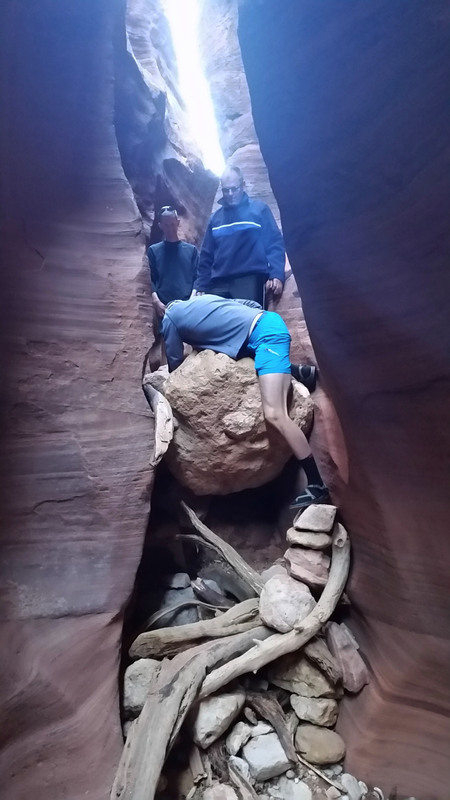 It didn’t take long before we found our next obstacle, a double chalkstone drop each into swimmers. No need for a rope on these, we just slinked off the chalkstones into the cold dark water below. The second drop had a large log stuck under it which was a nice support for our feet as we got ready to plunge into the deepest, darkest pool of the day. Wheewwww if I wasn’t already awake, that pool sure did the trick! The cold swimmer began to pull my core temps down and I quickly looked for sun to snap pictures of the crew as they followed on. This one was dark, deep, and cold! Where did the sun go?! Oh need some of that warmth! Could stay here all day! We kept trekking through the beautiful canyon and soon found ourselves at the keyhole waterfall. The keyhole waterfall is signified by a large hole that had been drilled through the sandstone by water just to the left of the waterfall. This was supposed to be the next rap, however a large log had fallen below the drop creating an easy to walk ramp. We just used the rap bolts as an anchor for a hand line and walked down. Once at the bottom we walked through a small corridor shaped like a mini subway. Logs and debris were all over the place, but they just added to the aesthetic. Gorgeous . . . just dont fall on us! Man what a beautiful place! 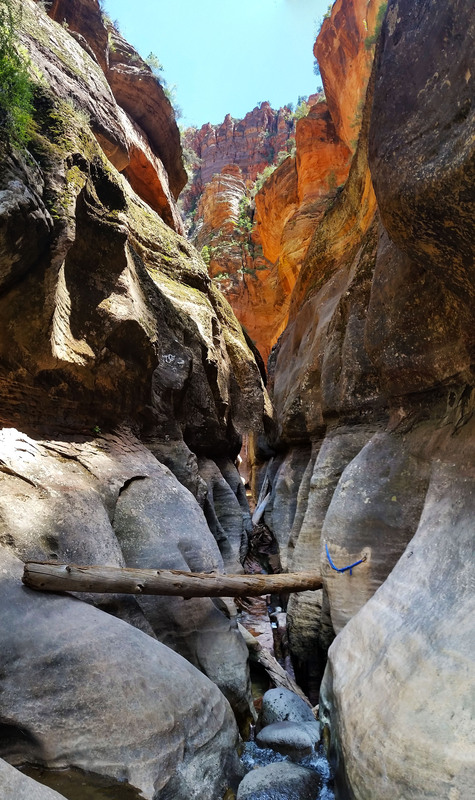 Finally we walked out into a nice open area with a vertical log wedged between the floor and the canyon wall. This was the upper subway just before the final rap into the lower subway. How nice it was to see this famously photographed sight in person. We took a final break before the long slog out, basking in the sun like lizards still trying to shake off the chill from the double chalkstone swimmer earlier in the canyon. Upper Subway – Famous vertical log! It was time to get moving again as I stuffed the final crumbs of salt and vinegar chips I had into my mouth. After a turn or two we found the final rap on canyon right to the side of a waterfall into the lower subway. 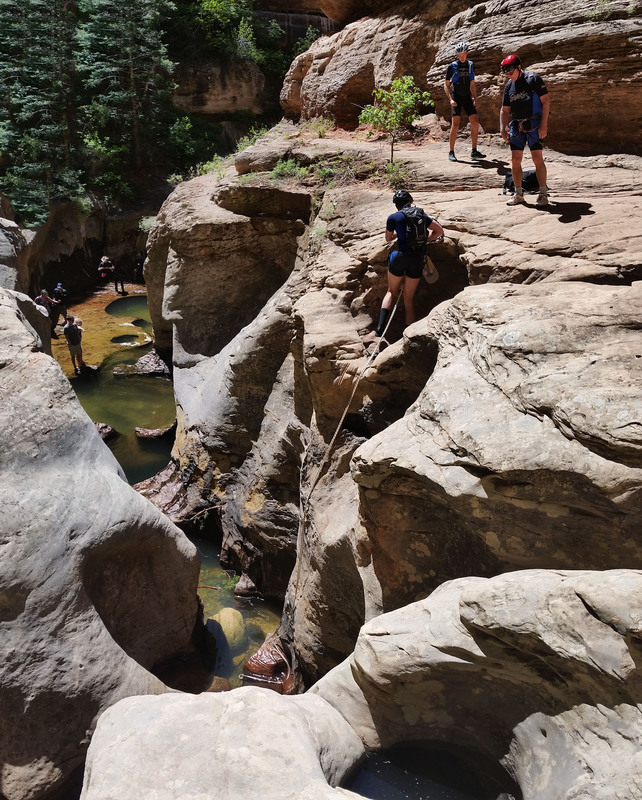 We could hear a large group of “bottom up” hikers below in the pools taking in the sights of famed formation. We set up our rope and rapped the final drop and were soon stripping wetsuits. It was nice not to need the suits any further. 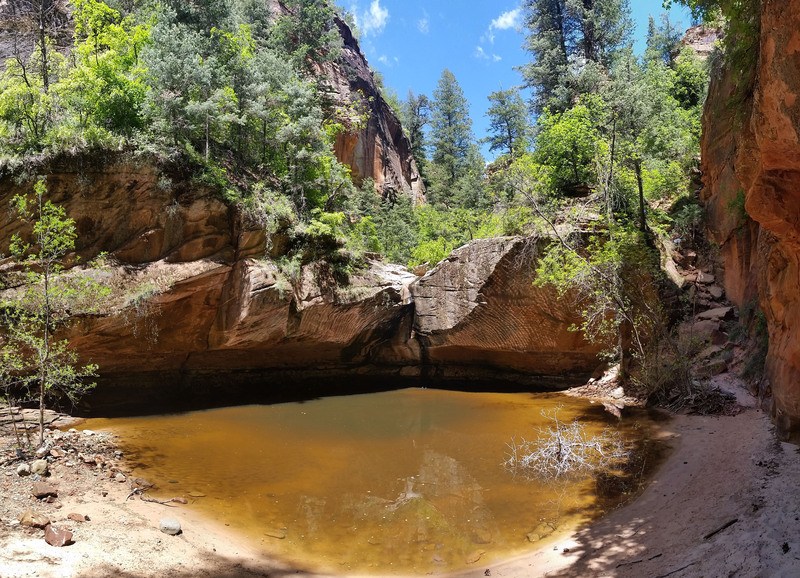 The rest of the hike was gorgeous… beautiful slick rock, cascading waterfalls, and lush green foliage everywhere complimenting the red rocks. After a few miles we finally reached the exit canyon right. I took the keys to the truck and took off up the Cliffside. Bye bye, I miss you already! I grabbed my bike from the trees where I stowed it and began to ride back to the upper trailhead. I had originally thought it was just a few hundred feet of gain in a few miles, but later research let me know that it was 7.5 mile ride with 1900 feet of gain. Let’s just say when the quad burning, calf aching, sweat pouring, beautiful view having grind was over, I was pretty happy! I drove back down, grabbed the guys and we headed back to Springdale for much deserved pizza and beer. What an awesome day enjoying Zion national park!!! I can see the lip of the rim! annnd let the sufferfest continue! Beautiful views from the bike . . .